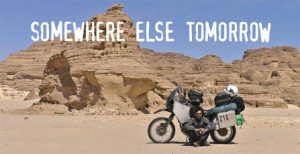 Adventure motorcycle travel is one of the most liberating ways to see the world. It is a very exciting, flexible and independent way of traveling. 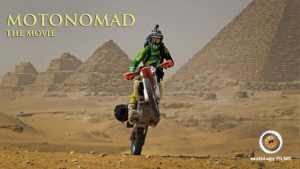 The freedom of an adventure motorcycle compares to very little else as a way to travel, so not surprisingly there have been many very good documentaries made over the years. Here’s a few to inspire you to hit the road on your own adventure motorcycle tour. Adam Riemann is a well known and respected Australian enduro rider and motorcycle journalist. After years of featuring in Australian dirt bike magazines, he has extended his career into filmmaking with this 90-minute movie. 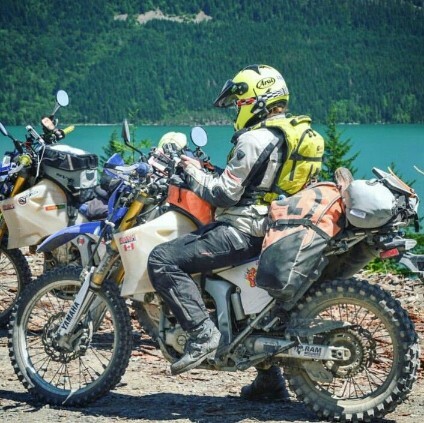 Adam and his mate Mark Portbury take us on a 7000 km (4,375 miles) journey from Austria to Egypt through seven countries on KTM 500EXCs. 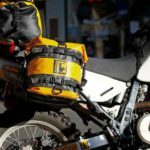 They have no film crew, no backup support vehicles and live entirely on what they can carry in their soft panniers on their EXC enduro bikes. The journey started in Austria because that’s where the KTM factory is, but to get to the pyramids meant going through seven countries: Hungary, Romania, Bulgaria, Turkey, Israel, Jordan & Egypt. Adam was adamant about using enduro bikes rather than much heavier adventure bikes and finding gnarly action scenes to keep the interest of his core followers, but make the story and cinematography appeal to anyone, not just motorcycle enthusiasts. 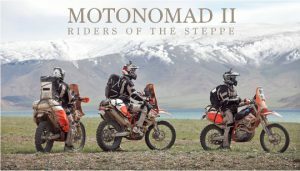 MOTONOMAD is a life adventure film. Adam is back with two mates to journey from Kazakhstan through to Russia. They venture into Siberia’s Altai mountain range and attempt to cross the great Steppes of Mongolia. 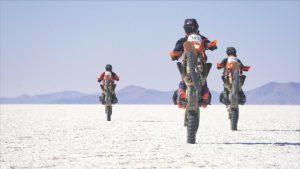 In the third chapter of the trilogy, Adam Riemann and two mates Mark Portbury and Chris Hollis travel 7000 km through Chile, Bolivia, and Argentina, following an old route of the 2014 Dakar Rally. 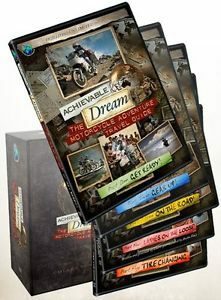 Horizons Unlimited founders Susan and Grant Johnson have put together this DVD set sharing their experience gained from years of Adventure Riding, their own around the world trip taking 11 years. They show us that you don’t have to be rich and famous and have backup vehicles to do the trip of a lifetime. It is the definitive guide for anyone thinking about doing an adventure motorcycle tour, whether to the next country or the next continent. Their 2-year project has culminated in nearly 18 hours of valuable information and entertainment. 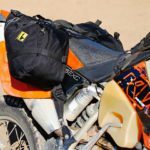 They have interviewed many other seasoned travelers who give their expert advice and tips, including Austin Vince (Mondo Enduro), Ted Simon (Jupiter’s Travels), Lois Pryce (Lois On The Loose) and many more they have met along the way. The series was filmed on location in the USA. Canada, UK, Switzerland, Spain, Germany and the South Pacific. These DVDs are available on Amazon as a collectors set or you can purchase individually. Guy Martin is a likable Lincolnshire truck mechanic with a broad Lincolnshire accent and sideburns to match. He is also a star of one of the world’s most dangerous motorcycle races, the Isle Of Man TT. Guy takes us on a 1000 mile adventure motorcycle tour of India, combining his two great loves – motorbikes and tea. 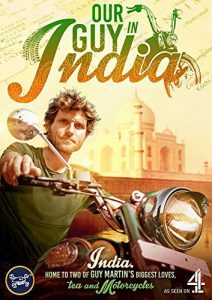 His journey begins in Delhi where he haggles for a Royal Enfield Bullet. Originally an English bike it has a huge presence in India. Guy’s journey takes in everything from tea plantations in the north to the tropical beaches of Goa in the south. He participates in the Blue Riband ‘Rider Mania’ race – the world’s biggest gathering of Royal Enfield motorcycles using the same bike he has ridden around India for a fortnight and changes nothing but the tire pressures. There are eye-opening experiences that change his outlook on life forever. Daniel Rintz has a dream to travel the world by motorcycle, but instead of saving up first, he decided to go and make money along the way. Daniel is a professional filmmaker himself and has produced a wonderful piece of film art. Daniel hit the road in 2008 on a BMW R80 and together with good friend Lars set out to circumnavigate the globe, working as they go. When they reach Egypt his buddy has had enough, so he goes it alone. Two years in he teamed up with fellow adventurer Josephine Flohr. They have since become a filmmaking couple, currently working on the sequel. This is more than your average motorcycle travel story, the difference being Daniel is a professional filmmaker and photographer. The imagery is stunning and high quality and would be at home on the National Geographic channel, it’s that good. This DVD is available on Amazon for $11.99 to buy or $3.99 to rent. The Long Way Round and Long Way Down featuring Ewan McGregor and Charley Boorman are perhaps the most famous adventure motorcycle touring DVDs. 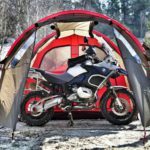 What are your favorite adventure motorcycle travel doco’s? Have you had your own adventure? Share your thoughts below. what an adventures journey guys you had from Hungary via five other countries to Egypt. that is what we call adventurous. Hi Otis. Yes they certainly had an epic adventure, even more amazing when you think they filmed this themselves, had no backup vehicles and film crew and carried everything on lightweight dirt bikes. The journey took about two months. Thanks for your comments, there’s plenty more of these to follow.